The HE1000 can be used in pairs to provide a point-to-point HSSI extension between routers. Must be used in pairs. HSSI is a common WAN port interface for higher speed routers and servers, which can operate at up to 51.84Mbps, over distances of up to 10 metres. In data warehouses where large numbers of servers need interconnecting, or where multiple ISPs operate from within the same premises, this distance restriction can become a major logistics problem. Metrodata’s HE1000 HSSI extenders can be used to increase these connection distances up to 150m using standard coaxial cable, which means that separate cabinets, separate rooms, or even neighbouring buildings can now be used to locate equipment with secure access for each ISP. A primary design goal for the HE1000 was ease of use, and the HE1000 is truly Plug & Play, with almost no configuration necessary for point to point HSSI extension between routers. The HE1000 operates as a HSSI DCE, providing the transmit timing to an attached router, with a simple dip-switch selection for either N*1Mbps or standard telecoms bandwidths such as 34.368Mbps, up to the maximum data rate of 51.84Mbps. The HE1000 provides a standards-compliant asynchronous serial interface (ASI) as the transmission medium. ASI runs over standard coaxial cable terminated with BNC connectors. It provides a much more flexible and robust interconnect than HSSI. 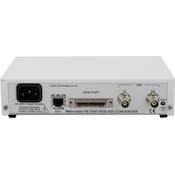 The ASI interface utilises an adaptive equaliser stage in the receive interface and can operate over 150 metres of good quality coaxial cable. The HE1000 ASI interface is fully compatible with the ASI interface presented on Satellite modems. The HE1000 can easily be rack mounted in either a 1U two unit rack mount kit, a 6U eighteen unit rack mount kit. In the schematic above, 2 routers are located 150 metres apart with HSSI interfaces operating at 51.84Mbps. In the schematic above, the HE1000 provides a conversion function between a router HSSI port and a satellite modem with an ASI port, allowing the router to connect to the satellite modem, which is 150 metres away. Asymmetric data rates (e.g. 8Mbps one way and 34 Mbps the other) can be supported by the HE1000. An equivalent network connection using a satellite modem with ASI interface connected to an HE1000 MUST also exist at the other end of the satellite link. N.B. The HE1000 CANNOT be connected directly to an HSSI satellite modem.